Our advanced search tool for basketball teams is truly unique. 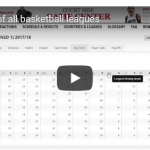 It lets you search, filter, and rank all basketball teams in the world. On any combination of criteria. For any season. Which basketball team played at the highest pace during the 2016/2017 season, and which team had the highest free throw percentage in the world this past season? Which team had the longest winning streak and which team had the best defensive rating? You can find the answers to these questions and many more with our advanced search tool for basketball teams. Take a look at our tutorial video and see how everything works. Go to our Game Center to see all the features that we offer. One Response to "Advanced search tool for basketball teams"